We are also running the Moto GP into the tour for the Dates July 24 – Aug 1, 2012 – See Itinerary Below for Moto GP. It is one extra day on top of the normal LA to San Francisco Tour. Summer is a great time of year to stay out of the desert. I cater this route to the people who sign up for the tour’s preference. There is also the option of working Yosemite into the trip, or to spend more time right on the coast. By skipping Yosemite, we can DO LESS MILEAGE PER DAY AND MORE TIME EXPLORING ON FOOT OR MOTORCYCLE EACH DAY. Again, this tour is organized by me according to the group. I like to customize each of these tours with the input of the people on the tour. We hit all the great spots like Neptune’s Net and The Rock Store. Great little excursions and rides off the beaten path all the way up the coast on the Pacific Coast Highway PCH and the 101. 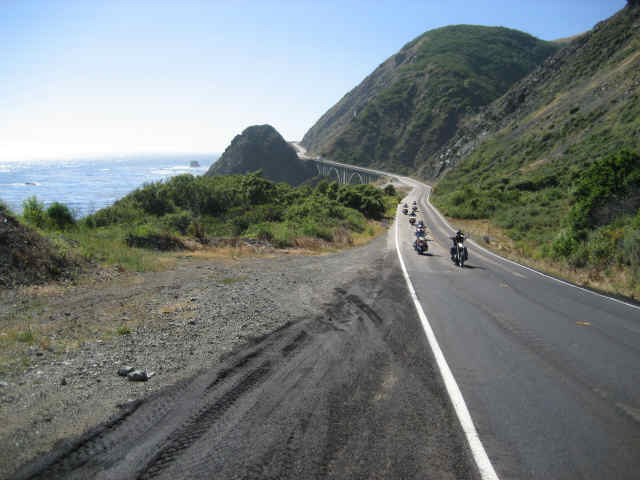 We explore the California Coast, coastal mountains, canyons, and great motorcycling roads. We stay in a great home base every night and have a 1/2 day ride to our next destination. That gives us the afternoon to Explore each area by motorcycle more, go fishing, a hike, or whichever activity you choose that day. I will have different options everyday so each person can be with the group or explore on their own on the Explore Day. You get to slow down and really get to know the people and culture of the area. You will get plenty of riding in I assure you. The afternoon can be spent exploring each area on bike, not just blasting through town from point A to point B. Everyone on the trip will have some input ahead of time on our itinerary and activities. Let me know what you like and are interested in on the trip, and I cater each trip to the group on the trip. If there is something you really want to do, let me know, and I will try to fit it in. We will explore areas from Los Angeles to San Francisco. This is basically a custom / group tour made by Ride Free, where everyone has an amount of input. This is a great tour for veterans of the Ride Free Family, or new people also. I can schedule one of these one or two week tours any time of year. And, they don’t have to be limited to just California, we can branch out no problem. It is a semi custom tour. 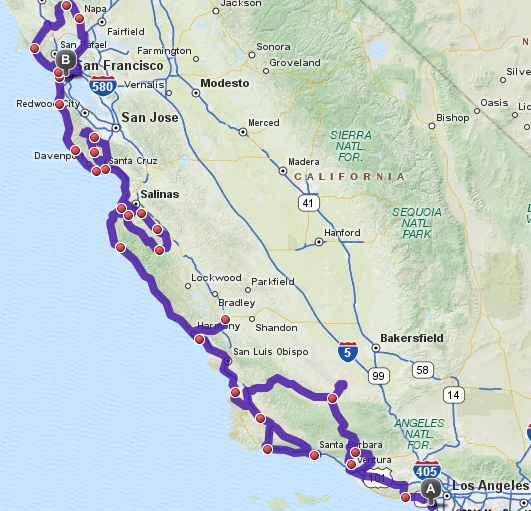 Click here for details of the California Dreaming Tour which is similar, but is a loop, not a one way. There is a $350 one way fee already included in the tour price for the return of motorcycles to the starting location.